The latest version of Realtek HD audio driver is 6.0.1.7655 and is fully compatible with Windows 10. Realtek has just updated its High Definition Audio Codecs and the latest version now supports Windows 10 operating system as well. 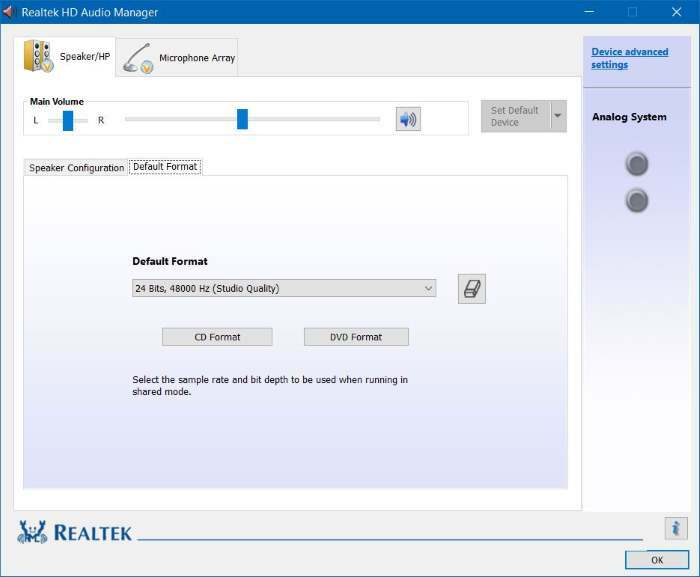 Windows 10 users can now download and install the newest version of the audio driver to get Realtek HD Audio Manager to control various audio related settings. According to Realtek, the latest version supports ALC882, ALC883, ALC885, ALC887, ALC888, ALC889, ALC892, ALC899, ALC861VD, ALC660, ALC662, ALC663, ALC665, ALC671, ALC672, ALC676, ALC680, ALC221, ALC231, ALC260, ALC262, ALC267, ALC268, ALC269, ALC270, ALC272, ALC273, ALC275, ALC276, ALC280, ALC282, ALC283, and ALC290 chipsets. You can download the read me PDF file from the download page to know more about changes and fixes. Separate downloads are available for x86 and x64 systems. So, make sure you download and install the right version. The link given below is only for Windows 10 operating system and it might not work on previous versions. If you receive “Windows can’t verify the publisher of this driver software” during the installation, simply click “Install this driver software anyway” to continue the installation. You may need to restart the PC to complete the installation. Thank you for sharing. Before I read this, my problem was resolved by Driver Talent. My problem was there was no sound after updated to Windows 10. They say Driver Talent could solve this without searching becuase it could find the best-match drivers with simply click. I tried and it made it. :) I will keep this post. Thank you man. Audio drivers available for download from the Realtek website are general drivers for our audio ICs, and may not offer the customizations made by your system/motherboard manufacturer. To be sure you obtain the full features/customizations provided in your original audio product, please download the latest drivers from your system/motherboard manufacturer’s website. I accept to the above. Where are the audio manager files?